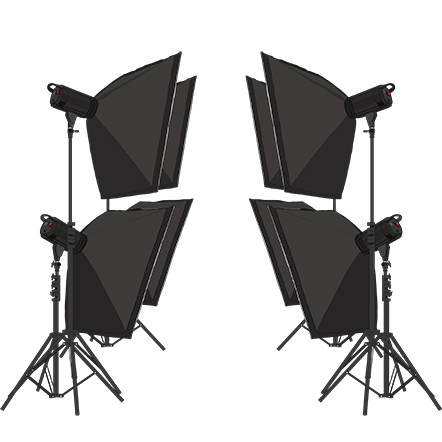 Uses: HD photos, multi-angle shooting, and 360° animations. 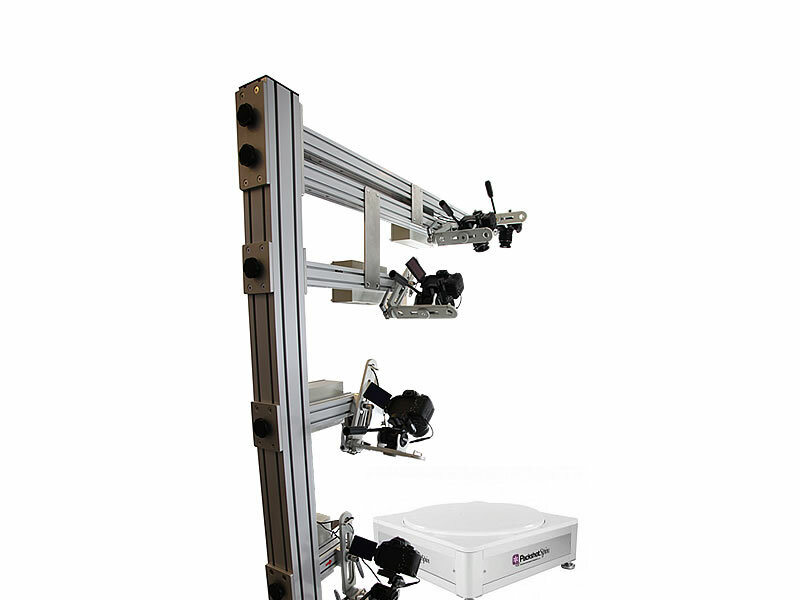 The integrated software suite automatically synchronizes the rotation of the plate and management of the camera. 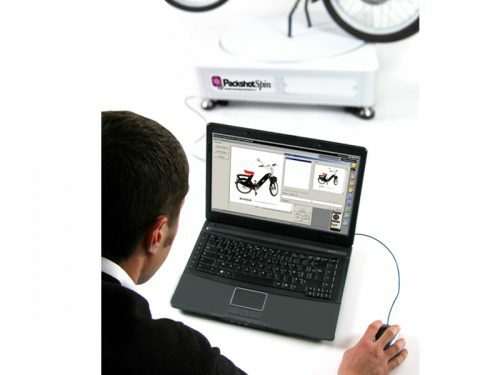 The view of the product image is produced in real time on your computer monitor (Live View). 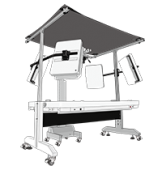 The equipment is thus entirely controlled and assists you in positioning the product, creating multi-angle photos, and interactive 360° animations. 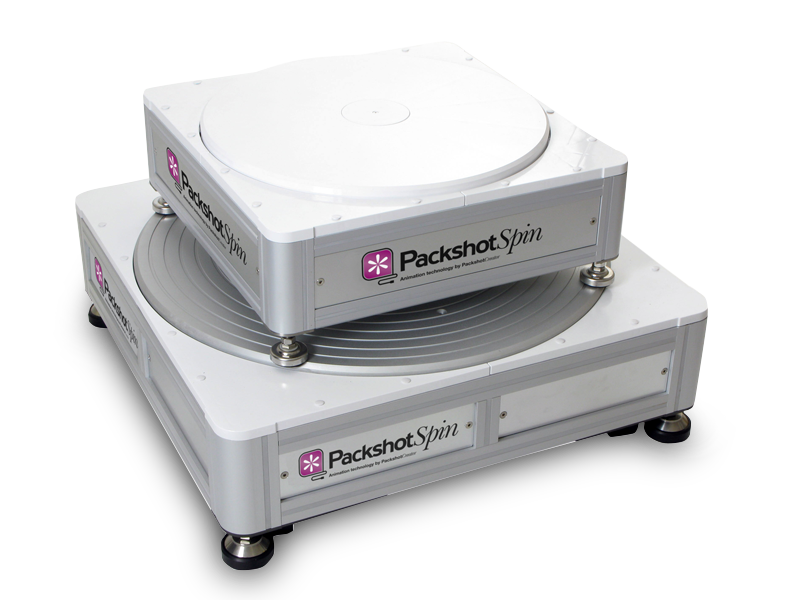 Thanks to the different turntables that can support products up to 320 kg, the PackshotSpin machines can be used to photograph mannequins as well as household appliances or spare parts. 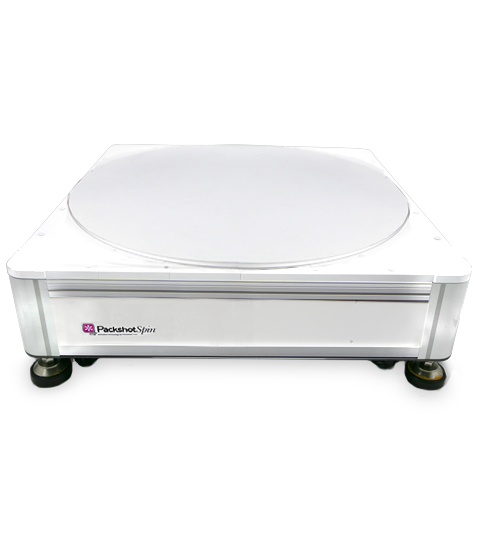 The dimensions and weight of your products will no longer be a problem to achieve 360° animations. Our turntables are compatible with standard cyc walls or backlits like Lastolite backlights and lighting kits, but also with the LuminaPad+ Mark II in backlight mode: produce your own 360° or multi-angle views, cut out automatically in a few minutes. As an option, our PackshotSpin XL allows you to animate even larger and heavier products (see photos above). 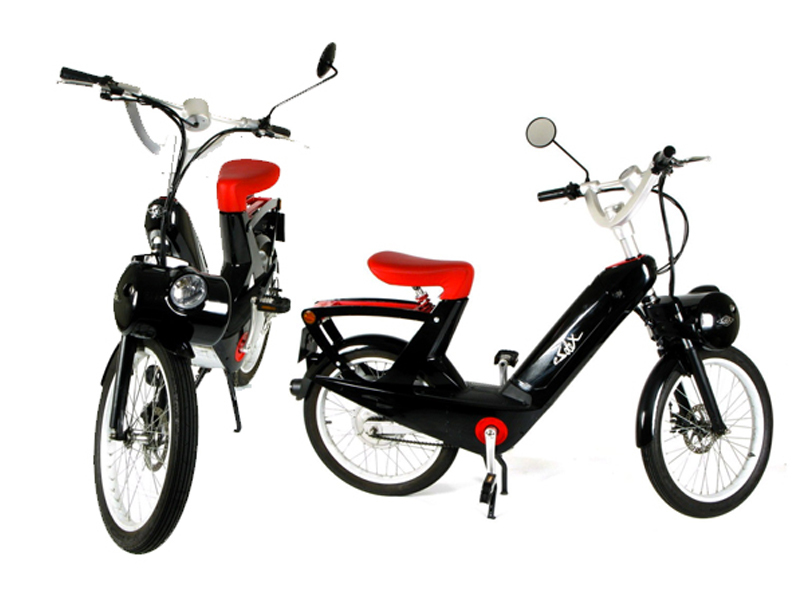 THE perfect solution for two wheels or furnitures. 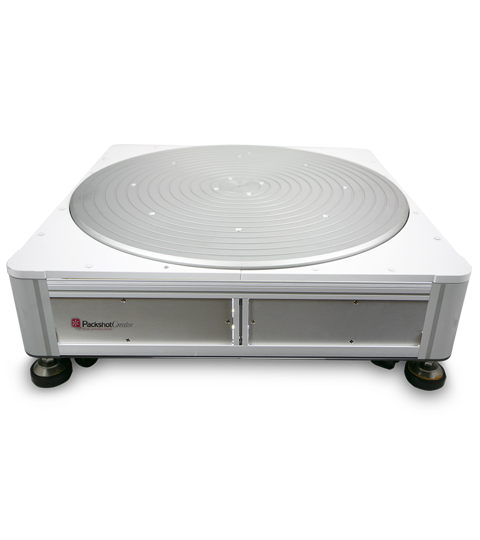 The only turntable with 3 meters of diameter who can support up to 600 kg. The platform engine is controlled by a remote control interface (to protect it from possible interferences): create even more precise 360° animations thanks to a continuous rotation. Avoid any movement during the shooting process of your products. You can preconfigure the features of a whole series of images (size, file name, format, storage location…). The shooting settings are also applied upstream of the shooting (framing, product position, or angle of 360° shots). Create a custom library of profiles according to your needs and the type of products to be photographed, and boost your productivity. The PackshotSpin solutions are configured to be combined with our shooting systems in spherical or hemispheric 3D, augmented reality, or virtual reality. 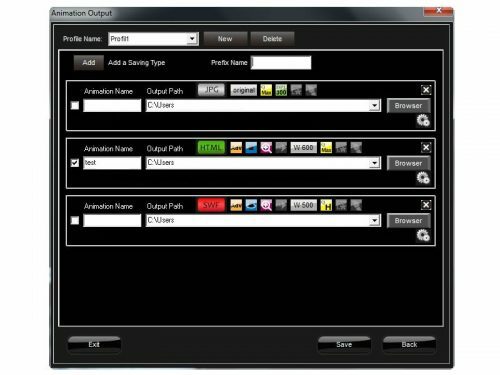 This automated mode of shooting enriches your visuals creations and the user experience of your clients. For even more performance, PackshotSpin can be complemented by a light kit and White FX platform which makes possible the production of visuals on a pure white background. 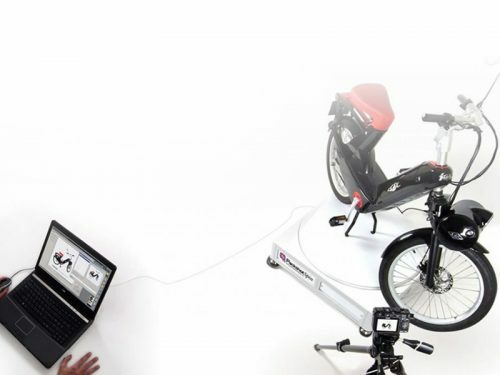 Predefine shot angles to the degree, with up to 360 photos to create a 360° animation of your product. A comprehensive interactive presentation in mere minutes. The software incorporates a ghost image function which enables you to see a previously photographed product transparently. This image allows you to place your next products in the same position. A whole range of products can be photographed under the same shot angle. Simultaneously generate up to 10 files in various formats and styles: from HD photos to 300 dpi, to photos in 72 dpi that are perfectly suitable for web use. Ideal when you wish to export the same visuals, but at different sizes. 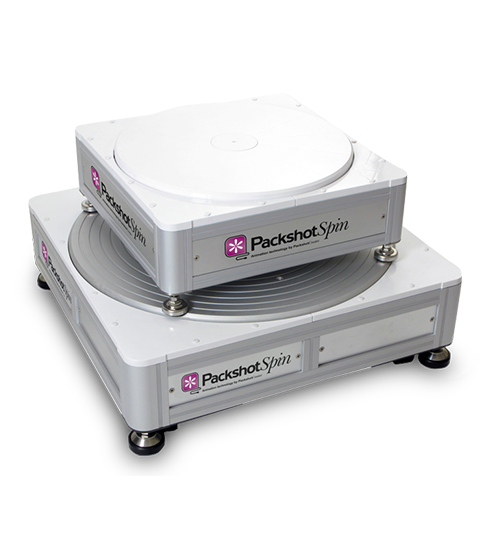 The PackshotCreator software automatically synchronizes the rotating plate with the camera. 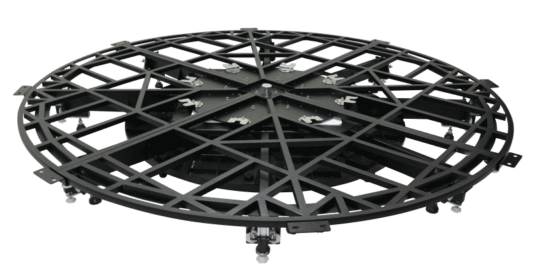 The rotating plate is entirely controled with a precision down to the degree to create multi-angle and 360° views. Evolutive when combined to the 3D systems. You will be assisted during the set-up of your PackshotSpin by one of our project managers. With our project manager, you will benefit from our 15 years of experience in research and innovation. 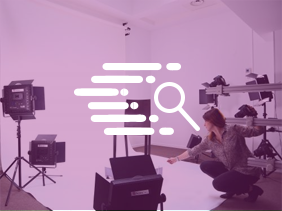 Combined with the PackshotSphere X5 swivel arm, you transform your PackshotSpin into a 3D spherical and hemispheric visuals acquisition solution.